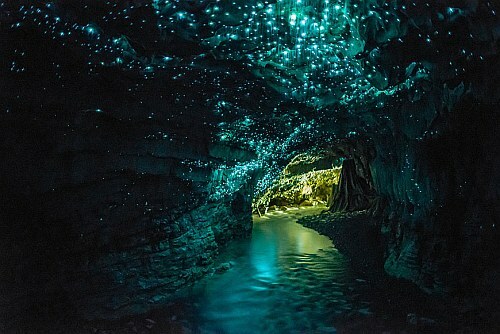 Air New Zealand has dropped the price of their 1-stop flights from Calgary to Auckland, New Zealand down to $988 CAD roundtrip including taxes. This is about 30% below the typical best prices from Calgary to New Zealand. These are also the 1-stop flights via Vancouver, the fastest and most desirable flights from Calgary to New Zealand. Click on the departure date box and look for the cheap date combinations. Look for the dates that are $1072 CAD roundtrip. There are quite a few dates in September and October. For November travel, focus on the Nov 4, 11, 12, 15, and 22 departure dates. In December, try Dec 9th as your departure date. For January/February travel, focus on the Jan 23, 29 and 30th departure dates. 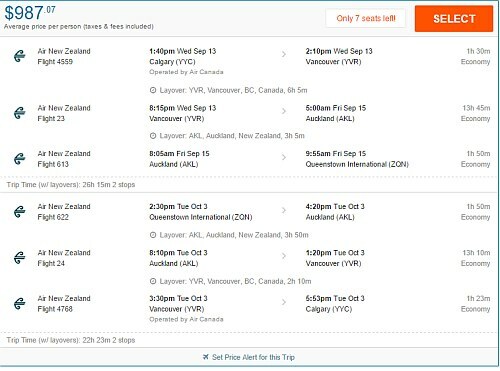 Update 9/4 - Air New Zealand has dropped quite a few more of their 1-stop flights from Calgary to Auckland, New Zealand via Vancouver down to $975 CAD roundtrip including taxes. There are flights available for this price for travel in September 2017 and all the way up to June 2018. Look for the dates that are $1071 CAD roundtrip. After your Flighthub search completes, you may want to click on 'Flexible Dates'. Look for the dates that are $975 CAD roundtrip. You may need to try a few different date combinations to find flights with shorter layovers in Vancouver (2-3 hours is ideal). Note that on Flighthub, the flights with the shortest layovers may not always be at the top of the search results. Sometimes you need to scroll down the results a bit. You may also be able to find flights for $987 CAD roundtrip from Calgary to Christchurch, Nelson, Queenstown, or Wellington, New Zealand using a similar strategy as above. Try finding one of the $987 flights to Auckland on Flighthub first. And then try changing it from Auckland to a different city in NZ, and running the search again. Update 9/10 - There are now some 1-stop flights from Calgary to Auckland, New Zealand for $985 CAD roundtrip that are kind of close to peak Christmas and New Year's travel dates (for a longer trip anyways) and for January 2018 travel. calgary, yyc, flight deals, auckland, new zealand, akl, air new zealand, australasia and oceania. 8 Responses to "Calgary to Auckland, New Zealand - $975 CAD roundtrip including taxes | 1-stop Air New Zealand flights (other cities in NZ also available)"
Booked successfully for Oct 7-28. Thanks Chris! No problem Javid, I'm glad it helped. Have a great time in New Zealand! Trying to book now and flighthub keeps popping up with a higher price at the last step, any advice? Using the exact flights listed on google. "Unfortunately, your flight is no longer available at the current price. The price has increased by $484.00 per passenger. Includes taxes and fees. Prices quoted in CAD. Airline baggage fees may apply." On Flighthub, I'm seeing them come up as 'Phone Only' fares now, for $987. You may want to try calling and see if your dates are still available for $987. If you try searching on Momondo, you may see Flighthub come up as a search partner, and can click through right to the booking page, without getting the 'Phone only' message. Doing that, I've seen them for $991. It can also just be that Google Flights is showing a price that has recently sold out for those particular dates, or there are not enough tickets left for those dates. It looks to me like you're trying for 4 tickets, and it can sometimes be tough to get all 4 tickets at the cheapest price. You can try setting the number of passengers on Google Flights to 4 and see if any dates still come up with cheap prices. It can be worth trying slightly different dates to see if it makes a difference. No problem! Have fun in NZ ! Just wondering what transit time everyone else found for this flight? The only ones that were a good price had a 12-13hr wait at LA. When this was posted about a week ago, most of the ones I saw for $985 were the perfect 2 hour connections in Vancouver each way (as shown in the screenshot in the blog post). But unfortunately I think these are all gone now.